I’ve not posted here for a bit longer than usual. I am not sure why as I’ve got a few posts running round my head at the moment. I did have some time this week but that was eaten up by sorting out a few backend things on this blog. Last weekend I updated the blog to PivotX – 2.0.0: beta 12j and I must have made a mistake or two. In the new version of pivot some thing have changed (Upgrading from previous beta releases). By the middle of the week I had noticed a few funny things going on, individual posts were giving 404 errors. I tried uploading the files again but due to the careless way I had originally installed pivot I had to be careful not to over write my templates. I them made things even worse. To cut a long story short I uploaded a clean version of pivot, and move my data across then deleted the old directory. Hence the change of theme. I suspect that the root of the problem stems from the way I move the blog to here from the Sandaig Primary site. I could probably footer around and put the old theme back in place but as I had never really finished that one I was not too sad to see it go. At the moment I am using the bare bones theme which is designed to be customised. One of the main reasons I use Pivot (which is now officially pivotX) is the fact you can easily customise the theme of you know a little html. The original reason I picked it was it was the only blog I could find that used flat files rather than a database. PivotX now gives you the choice to use MySQL if you want. At the moment I am sticking with flat files. I also quite like the barebones theme, I’ve always like fixed width or maximum width webpages but flexible is beginning to grow on me. I guess I’ll tweek away at the template and css, but I now have a much cleaner starting point to start from. Another thing that seems to be fixed by the clean install is the MetaWeblog API which I had managed to break in the move here so I am now back to blogging with TextMate which I am delighted about (or will be if this post works when I hit ?-?-p). All I need now is a bit of time to tweek and some more to actually blog, for today this will depend on the weather. One of the big plusses of the ScotEduBlogs site is the production of aggregated, time sorted rss feeds. I’ve just added this feed to my sidebar on the left. If you click on the ScotEduBlogs Latest link on the left it will a list of the latest education blog posts from around Scotland. 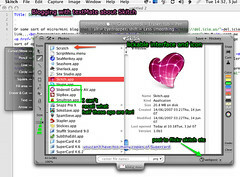 In Pivot I add this by putting [[rss:http://www.scotedublogs.org.uk/blogs/rss]] in my template. If you are using wordpress (like a lot of Scots Edu blogs) you can use the RSS Sidebar Widget as I did on the scotedublogs aggregation blog. (thumbnail)There are all sorts of other ways to use the feed, from subscribing to it in your feedreader to grabbing it in other applications. I’m playing with the Dashcode Beta and have crudely adapted the RSS desktop widget to display the ScotEduBlogs feed. Click on the image on the right to see the widget in action. It still needs some testing and the application of some graphics, but if you are using Mac OS x 10.4 you can download it and try it out. is GPLed and extendable. I’ve used a few extensions to show flash content and even hacked one to play mp3s. I just installed another one that will be handy for me rather than the children, slink. which reflects common links I’ve made recently, but it is simple to change by editing a text file. This is the sort of thing that keeps me amused while doing the more important job of running the children’s blogs. I’ve made a very small addition to the blog setup here. Type (star) for a (star) and (wish) for a (wish) while blogging or in the comment form. I don’t really expect many folk to use this on my blog but it might help with peer assessment on Sandaig Otters and Sandaig Poets. I’ve managed to add it to the Emoticons popup link in the comments form too. I’ll be adding it to the Primary Six SJ blogs setup too. Pivot makes this easy to do.